WANT: This is often thought of as a psychological desire which makes life just a little more enjoyable, but which is not physiological necessary to life. You need oxygen, but you want a hot fudge sundae. Satisfaction is achieved by fulfilling wants. An economy, or economic system, that relies exclusively on governments to allocate resources and to answer all three questions of allocation. 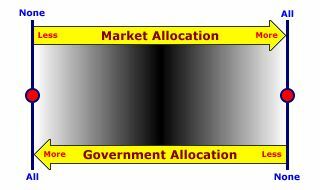 This theoretical ideal has no markets, government makes all allocation decisions. Then contrasting theoretical ideal is a pure market economy in which markets make all allocation decisions. A pure command economy is a theoretical extreme on the spectrum of economic systems that does not actually exist in the real world. It does, however, provide a benchmark that can be used for comparison with real world economic systems. In pure command economies, governments force all allocation through involuntary taxes, laws, restrictions, and regulations. Governments set forth the laws and rules. If folks do not follow the rules, then they are punished. Governments can punish those who do not follow the rules because... well... because they are the governments. Given a choice, most humans probably would rather NOT pay taxes or have their cars safety inspected. They follow government rules because they have to, because that IS the law. The real world embodiment of a pure command economy is termed a command economy. The communistic/socialist economies of China and the former Soviet Union are primary examples of command economies. While, in theory, resource allocation could be undertaken exclusively through markets or governments, in the real world, all economies rely on a mix of both markets and governments for allocation decisions, what is termed a mixed economy. PURE COMMAND ECONOMY, AmosWEB Encyclonomic WEB*pedia, http://www.AmosWEB.com, AmosWEB LLC, 2000-2019. [Accessed: April 26, 2019].